I just bought the Murad Clarifying Cleanser and really like it. Before that I had Mario Badescu acne cleanser and I like the Murad better. What is your favorite? It has not dried out my skin but I only use the Murad cleanser and I use a different brand toner and moisterizer. For moisterizer I use First Aid Ultra Beauty Repair cream and for a toner I use Olay Oil Minimizing Toner. This thing is BEAST. Took me 8 years of searching to find this monster. I love it so much. I really been enjoying the cetaphil one it's for any skin type and it's just a very basic cleanser. I also like the l'oreal 360 for sensitive skin it comes with the little face scrubber and it gets your makeup off great without drying or stinging your face and eyes. Almost all Clean and clear products. Damn those sound fannnncy. 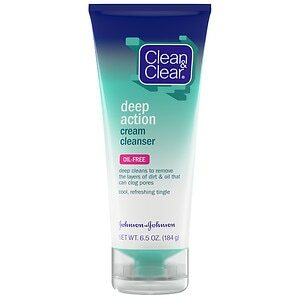 I use clean and clear morning burst but I have to switch because Illinois (where I live) just made microbeads illegal. Good thing I exfoliate with sugar. Because they're plastic, and therefore a pollutant. Aveeno Clear completion.. But i hardly use it unless my face is actually dirty or i'm wearing makeup.. I try to keep the chemicals off my face my skin is too sensitive. Non aluminum baking soda or apple cider vinegar. Both are gentle but effective on my skin. I use a facial brush. I use 3 Clean and Clear products and they work for me. I currently use Neutrogena blackhead eliminating daily scrub and the rapid clear foaming scrub. Best facial cleaners I've used so far..
Sulfur soap! Sulfur killed the dinosaurs. It can handle blackheads and pimples no sweat! ooo I have a sulfur face mask that is awesome but it does have a downside... it smells like a dirty, old hotel room and cigarette smoke. Home > Fashion & Beauty > What is your favorite facial cleanser?